This issue of INSIDE ATLAS.ti brings you updates on several important ATLAS.ti-related issues. 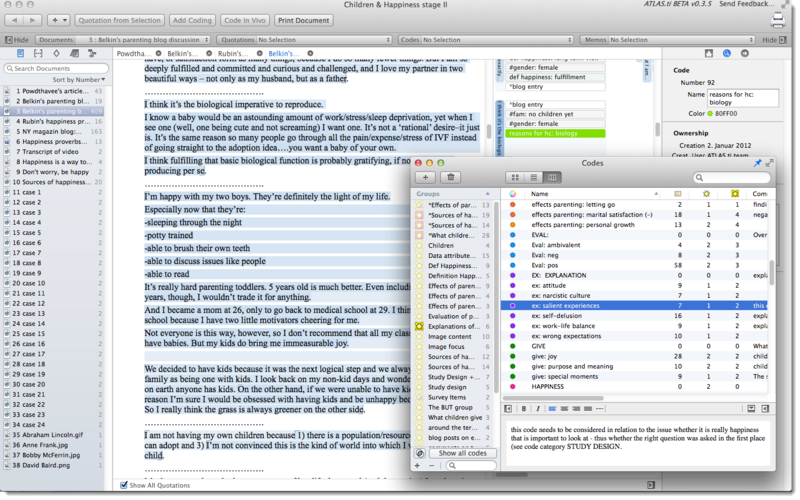 Chief among them is the long-awaited Mac version. But we also have news about training events, online opportunities, new publications, and a number of powerful recent innovations that may have already found their way onto your computers in recent service packs. We know that many of you are eagerly awaiting the new Mac version. While the originally published release date of July had to be pushed back slightly, we would nonetheless like to offer you an exclusive first glimpse of ATLAS.ti for the Mac and its features in this issue. We are happy to announce that the official release has now been set for September 17, 2014. We apologize for the delay but are we certain that it will be worth the wait - the additional features will make it an even more mature product all around. The public beta version release is already imminent and will be introduced at the Berliner Methodentreffen in Berlin, Germany, on July 17 and 18. - Read more here. Also, we are launching ATLAS.ti for the Mac with a huge sale - starting July 1, you can pre-order the Mac version at a full 30% discount, good for any license. - Read more here. Your questions, comments and suggestions are always most welcome. Please do not hesitate to drop us a line via [email protected]. We know that many of you are eagerly awaiting the new Mac version. Below you see ATLAS.ti for Mac in action. While the expected July release date had to be delayed, we are happy to announce that the official release date is set for September 17. The first public beta release will coincide with the Berliner Methodentreffen in Berlin, Germany, on July 17 and 18. If you are interested in participating in our beta testing program, feel free to apply here: http://macbeta.atlasti.com (see Error: Reference source not found for more information). Below you see the main HU editor displaying a coded document and the Code Manager. The Navigator on the left-hand side lets you alternatively display your list of documents, codes, quotations, memos, or network views. 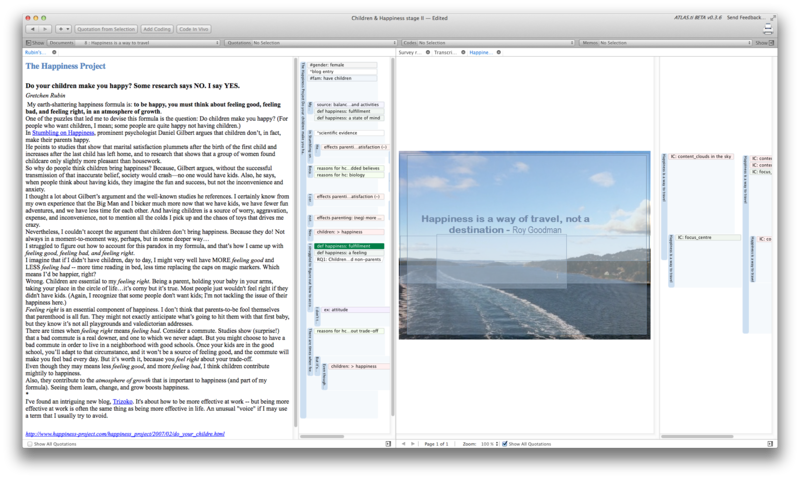 The multi-page view does not only allow to display documents side-by-side, you can display network views in this area. All the loaded objects are shown in tabs about the object you are currently viewing. You can easily switch between them. If your data is coded quite densely, with a lot of overlaps, you can find all your codes in a second, third, or even more columns to the right. 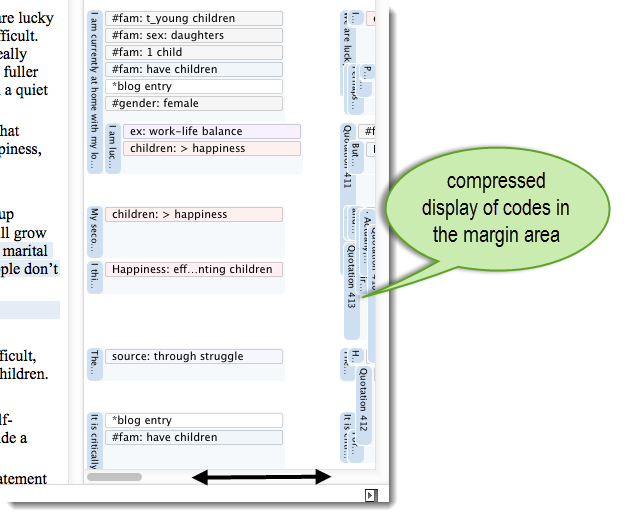 If the margin area is not wide enough, the codes are displayed in a compressed mode in order to show you more. The 'Inspector', which is always displayed on the right-hand side, shows more detailed information about each object. This could be a selected document, code, quotation, network view, or a node in network view. Below you can see the information for the code #fam: have children'. Coding works as usual via drag & drop from the Code Manager or the navigation panel on the right-hand side. 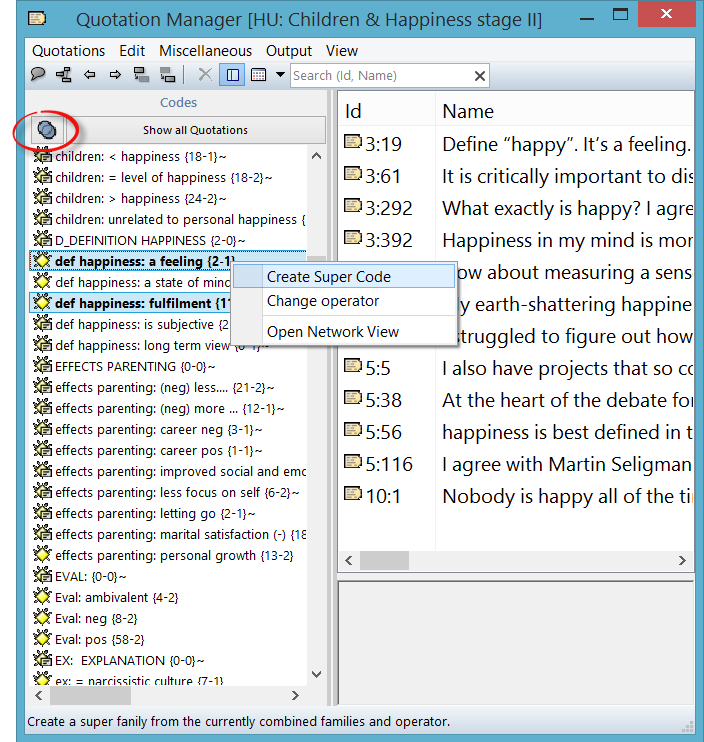 The tool bar allows you quick access to frequently used functions like creating quotations or coding data. Coding Multimedia files works like a charm. You will love it! Preview images (one per frame) are shown if you scroll down the margin that allow you to set highly precise quotation boundaries. Video and audio navigation is extremely fluid and smooth. 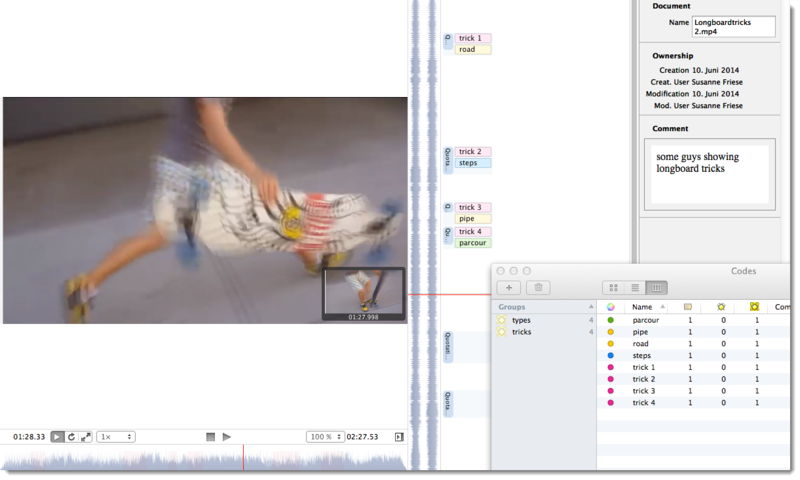 When selecting a video quotation, time locators for for start position, end position, and total length are shown. The display image shows the precise time in the video. Linking codes and quotations works as usual. ATLAS.ti for Mac will offer a number of different, new layout options. In the figure below you see the process of creating hyperlinks across documents. The initial release of ATLAS.ti for Mac will not contain the full functionality of the Windows version right away. But you will be able to perform all of the standard tasks like coding text, image, audio and video files, simple retrieval, writing comments and memos, linking quotations, linking codes, and working with network views. In addition, you will find cool new functionality that is not available in Windows. Options that will be made available in the subsequent months include the A-docs function, transcription, further analysis tools and team support. 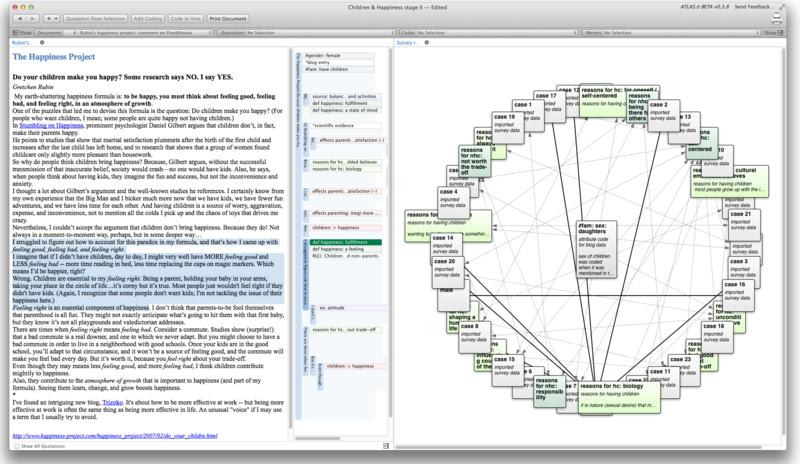 All new features in ATLAS.ti for Mac will become available via regular free software updates. Initially, project transfer will only be possible from Windows to Mac. Full bi-directional exchange will become available with ATLAS.ti 8 (for Windows) in 2015. As usual, Training & Partnership Development has been keeping busy developing and implementing learning products and services for the benefit of the community of ATLAS.ti user. It has also been representing representing the company at conferences and other events. Below is a summary of the learning products and services that we offer, as well as the past and future conferences at which ATLAS.ti is represented this year. Additionally, you may contact us at [email protected] if you would like to schedule a webinar exclusively for your group. This option is very convenient to show ATLAS.ti in the classroom or to research colleagues. These webinars are tailored to the specific group’s learning needs. These workshops are taught in three sessions of two hours each through web-conferencing. Introductory workshops are taught in English and Spanish, while advanced courses are taught in English only. The calendar of online workshops for the for the next two months is below. July 7, 9 and 11 (12:00 pm-2:00 pm EDT (New York time)). July 21, 22 and 23 (12:00 pm-2:00 pm EDT (New York time)). Access our library of free video tutorials at videos.atlasti.com. Under Tutorials, you will find short videos teaching the key functions of ATLAS.ti. Under Special Topics, you will find videos on a number of specific features of ATLAS.ti, including teamwork, networks, and survey analysis. In addition to these learning services, we have launched a research blog (www.blog.atlasti.com). Researchers and ATLAS.ti users discuss specific applications of the software and highlight the program’s features and functions. If you would like to contribute an article, do not hesitate to contact us at [email protected]. We welcome your contributions! The CAQDAS 2014 conference in Guilford, UK, deserves a few special words. This conference celebrated the 25th anniversary of the first CAQDAS conference that was organized by the Department of Sociology at the University of Surrey, UK. The 25th anniversary conference took place between May 1st and May 3rd in Guilford, at the facilities of the beautiful Horsley Park. Under the leadership of Dr. Christina Silver, the conference brought together QDA software developers, researchers, and academics to discuss issues as the intersection of methodology and CAQDAS, the latest developments in QDA software, and the contributions of the field as well as its challenges. ATLAS.ti was actively involved in this conference, represented by Mr. Jörg Hecker, Director of Business Operations, Ms. Neringa Kalpokaite, regional manager of Training & Partnership Development, and Dr. Ricardo Contreras, Director Training & Partnership Development. We presented a 60-minute demonstration of the software, with an emphasis on highlighting the upcoming ATLAS.ti for the Mac; made a Pecha Kucha presentation describing the pioneering contributions of ATLAS.ti to computer-assisted qualitative data analysis; presented a paper on software teaching methods; and presented a poster on the use of ATLAS.ti in the analysis of photographic data. In all, we are proud of having been part of this important event that celebrates the field of computer-assisted qualitative data analysis. Here's to another 25 years of CAQDAS! Auto completion in coding dialog now matches words in the middle of the code name. Previously the search was anchored to the beginning. If you want the search to be anchored at the beginning press the Crtl-key when opening the Coding dialogue. Select documents in the PD manager, right click and select Data Source Management / Bundle Selected PDs from the context menu . If you unpack a partial copy bundle file, this does not mean the documents you excluded from the bundle will not be listed in the PD Manger. This assumption is made frequently but it is incorrect. By creating a partial bundle, you do not automatically delete the documents from your project. You only pack fewer documents into your bundle. A complete copy bundle file always contains your HU file and the documents associated with your HU. If you create a partial bundle, only the selected documents are packed. The documents that you did not pack are still listed in the Pdocs-Manager in gray, but you cannot load them (unless they are already available in the library). 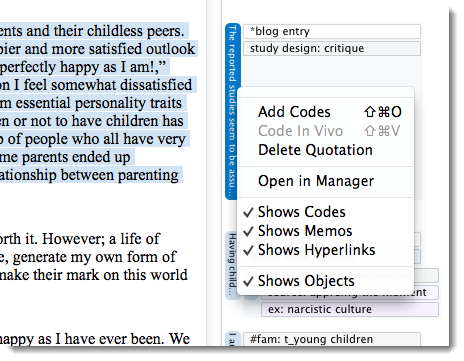 As codes are the grouping device for quotations, there is no need to have "quotation families." Consequently, the side panel in managers (which is used to display families) was previously omitted from the Quotation Manager. This has been changed now. 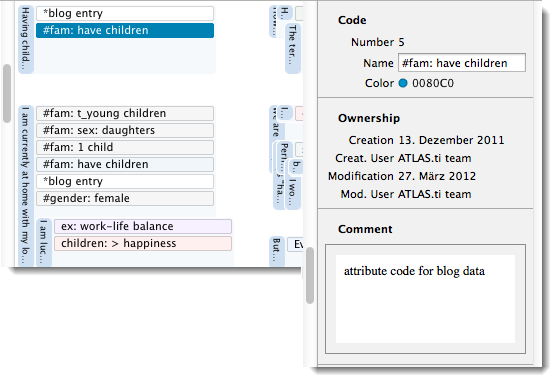 Instead of displaying families, the side panels in the Quotation Manager now displays codes. This allows you to use the Quotation Manager (instead of the Query tool) for Boolean searches. You can use the Venn diagram on top of the code list for combining codes using AND or OR. The results can be saved as super codes, just like in the query tool. If you used number prefixes for your documents, codes or memos, the sort order was not numerically correct if you started with 1, 2, 3 instead of 01, 02, 03, etc. Previously the 10 followed the 1. This has been modified now. With the release of the ATLAS.ti Android app (see http://android.atlasti.com), the import option has been extended. You find the import option for Android projects under Project / Import / Import ATLAS.ti iPad/Android Project. This option was already added in September of last year. However, as users often try to remove family items by selecting the Delete button, we would like to describe the proper work flow. Let's say you notice you have added a document, code or memo where it should not be. Now you want to remove it from the family. As in the old days, you can still use the family manager. But that is still another window away. Select the item(s) in the family that should be removed. 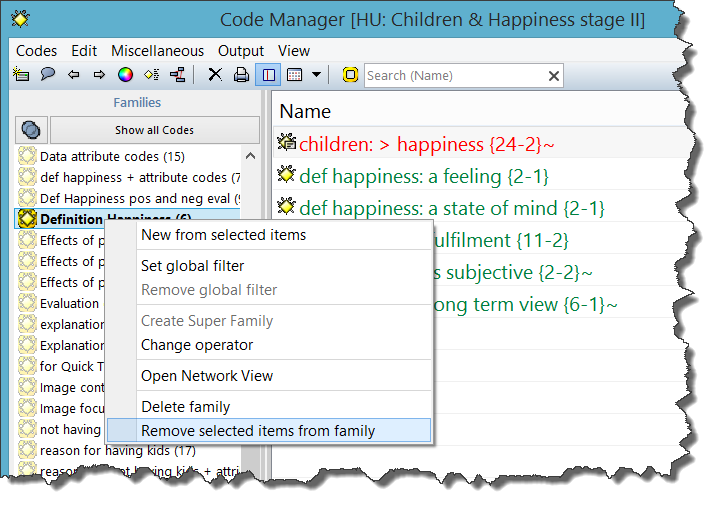 Right-click on the family in the side panel and select Remove selected items from family. ATLAS.ti 7.5 will be a FREE upgrade to all ATLAS.ti license holders. It will be available via the normal Live Update from the Help menu (see above) and will be installed automatically if you have set ATLAS.ti to always install service packs. We are happy to announce the launch of the ATLAS.ti Research Blog. Read articles about features, processes, functions, and research applications of ATLAS.ti. Also included are links to bibliographic resources, the ATLAS.ti video library, training services, and other useful information. Enjoy! We would like to introduce to you the new student trainer program. CAST trainers are qualified to provide fellow students, faculty and university researchers the basic first step instruction in ATLAS.ti. First step instruction includes the basics of document management, setting up a project, conducting coding procedures, and producing outputs. To join the CAST program, you should have conducted at least one study using ATLAS.ti and should feel comfortable with the basics of the software. If you are interested, you can apply to our program. After completing the form, you will be asked to take a selection exam. Those approved will join a group of students from universities worldwide. Program members will receive free training and support from ATLAS.ti GmbH. And who knows – maybe one day, you will become one of our certified professional trainers. Are you struggling to get to grips with qualitative data analysis? Do you need help getting started using ATLAS.ti? Do you find software manuals difficult to relate to? Written by the leading expert on ATLAS.ti, this book will guide you step-by-step through using the software to support your research project. In this updated second edition, you will find clear, practical advice on preparing your data, setting up a new project in ATLAS.ti, developing a coding system, asking questions, finding answers and preparing your results. This new edition has been updated specifically for ATLAS.ti 7. A companion website with online tutorials and data sets. Susanne Friese provides training and consultancy for ATLAS.ti at the intersection between developers and users, teaches qualitative methods at various PhD schools and works on advancing computer-assisted qualitative methods at the Max-Planck Institute in Göttingen. This just in: German-speaking users may be interested to know that a one day workshop for ATLAS.ti will be offered as part of the conference on qualitative methodology (II. Interdisziplinäres Methodentreffen für qualitative Methoden Leipzig) at the Universität Leipzig. Please see http://www.qmiw-leipzig.de/atlas-ti for information and to sign up. The long-awaited proceedings of the 2013 User Conference will be available in full shortly. Links to the individual papers are being added as they become available online. Please look for an official announcement and full details on the conference proceedings (published with Technical University Berlin Press) in the next issue of INSIDE ATLAS.ti.